Every four years, I excitedly await the winter Olympics, talking about it ad infinitum in the weeks prior. As a former figure skater during my high school years, it is my chance to watch figure skating's best compete on the world's stage. The beautiful performances, the nervous energy, and the drama bring me an enduring joy. In fact, when my boyfriend Chris and I started dating before the winter Olympics eight years ago, I warned him that this was my sport, and if he'd want to see me during the next two weeks he would need to brush up on his figure skating knowledge. To my astonishment, he dutifully researched the competitors, learned the scoring, and watched former performances so he could cheer alongside me in appreciation. When he started one-upping me with knoweldge on men's singles, I knew that he was a keeper. As a snub to February's variety of winter monotony, I dusted off my skates and took them down to the nearby ice rink. With the empty rink laid out in front of me, I imagined myself as talented as Michelle Kwan or Tara Lipinski, as I had many times years before. On shaky ankles, I then attempted a few spins and jumps that would have embarrassed my former coach. I may have lost most of my training over the years, but the fresh air and the feel of the ice beneath my feet felt invigorating after spending so many weeks indoors. Though Minnesota may still be covered in snow, my food preferences are evolving away from heavy comfort foods towards brighter, fresher flavors. Blending up fruit smoothies is a quick way to reenergize standard breakfasts and mid-day snacks. To bring these bright flavors to you, I have partnered with Dole Sunshine to #SharetheSunshine by sharing this pineapple coconut smoothie bowl. Topped with toasted coconut, banana slices, and frozen pineapple, the simple smoothie can be elevated into something special. Frozen fruit is the key to a quick smoothie with bright, vibrant flavor. I keep a steady supply of frozen berries, pineapple, and bananas in my freezer for this purpose. This recipe uses a combination of frozen pineapple and frozen bananas to thicken the smoothie (but ice can also be used in a pinch). The addition of full-fat coconut milk lends a creamy texture and rich flavor. While the smoothie could be poured into a glass, I prefer to enjoy this one in a bowl. The smoothie is dense enough to support a range of toppings, which takes it from a grab-and-go drink into a complete breakfast. 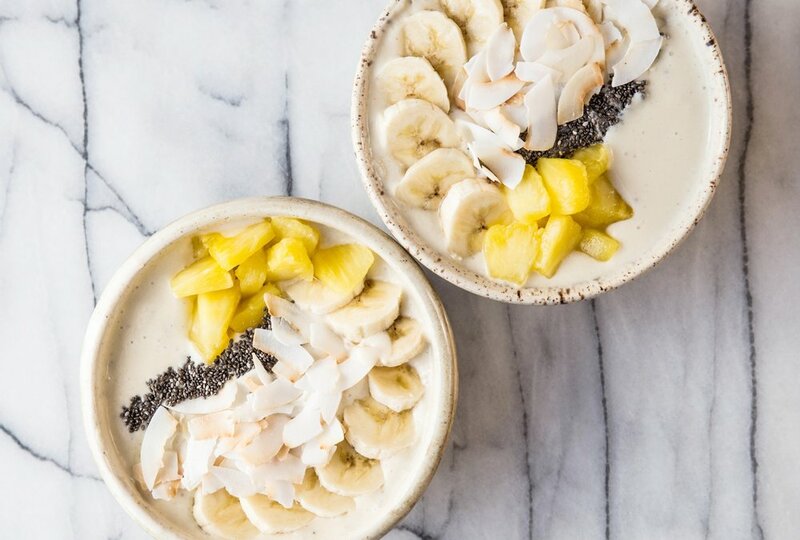 This Pineapple Coconut Smoothie Bowl celebrates the flavors of a piña colada in a fresh form. Frozen pineapple, banana, and coconut milk are blended together to form a thick smoothie base. Toppings like banana slices, frozen pineapple, toasted coconut, and chia seeds are layered over the top to bring additional flavor and texture. Serve for breakfast or enjoy as an afternoon snack. Place all smoothie ingredients into a blender and blend until smooth, scraping down the sides as needed. Divide servings equally between two glasses or two bowls. For smoothie bowls, top with desired toppings, and serve immediately. It is a new year. When the calendar on the wall is replaced, my mind drifts to thoughts of resolutions and new beginnings—often whether I'd like it to or not. This time last year I shared with you how I felt I no longer needed to make a list of resolutions. I was already keeping both mind and body healthy; a list to remind me to do so felt redundant. This year, however, is quite a different story. When I took a teaching job and moved across state lines this fall, it threw my life, my predictable patterns and routines, into disarray. Even though months have passed, I haven't been able to get the fragments back in order. I often feel like a puzzle with the outer edges intact, but missing a few pieces in the middle. I pay for a membership to a gym I rarely attend. More often than not, it feels as though I'm paying for the privilege of guilt; a packed gym bag sits in the front seat of the car acting as a silent, but continual reminder. As my days are long and filled with the hours of a first year teacher, I find I do not often cook for pleasure anymore. When dinner rolls around, I opt for the least involved option, which is often take out or some version of plain noodles covered in a fried egg. Truthfully, I eat this type of meal half a dozen times a week, throwing nutrition out the window. I miss food, real food. I have been working on these changes for awhile, however slow progress may feel at times. Just this afternoon I filled the refrigerator with a real, honest to goodness pork roast. Progress. It seems that when the new year slides in, we compile lists of all the things that we are doing wrong, instead of congratulating ourselves for the things that we are doing well. I, too, am guilty of this, if my prior confessions are any indication. It is noble to want to better ourselves, but I also believe that we shouldn't forget how far we've come on our journeys of self discovery. This is perhaps the most important thing we can do. When I was reading quotes about the new year, I was drawn to the one I shared with you above. As a teacher, I feel that for everything I do right in the classroom, there's a misstep that follows, whether it be a genuine mistake or simply something I could have said or explained better. By the day's end, there's a dozen of these little missteps that follow me to bed, before I bury them and start anew the next morning. If I'm making mistakes, whether I'm in the kitchen inventing a new recipe or leading young minds through the field of physics, I'm learning something new. I'm trying something new. I may not be perfect, never perfect, but I am strong and doing well. I'm making mistakes because I am putting myself out there and trying something new. While some aspects of my life may be neglected now, I'll figure it out. I always do. 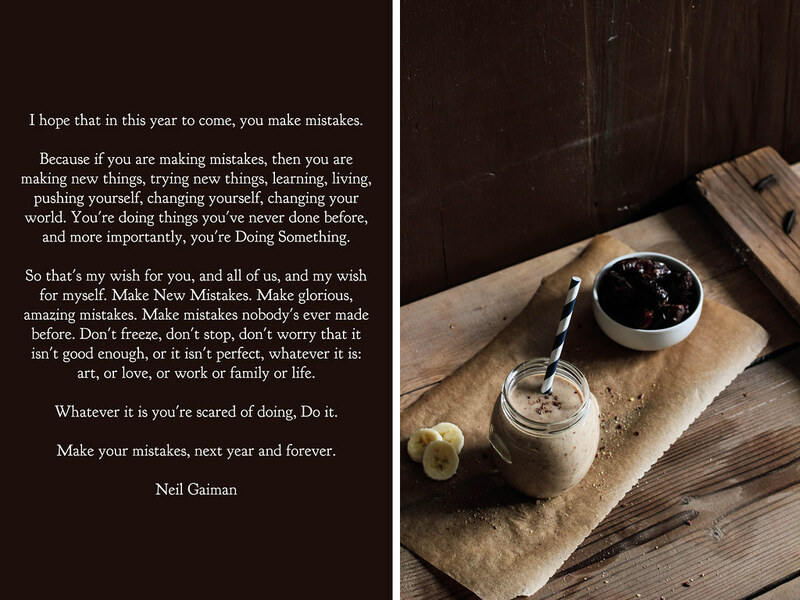 For your next year, I hope you make mistakes too. Lately I have been craving a good smoothie, but haven't gotten around to making one until this weekend. 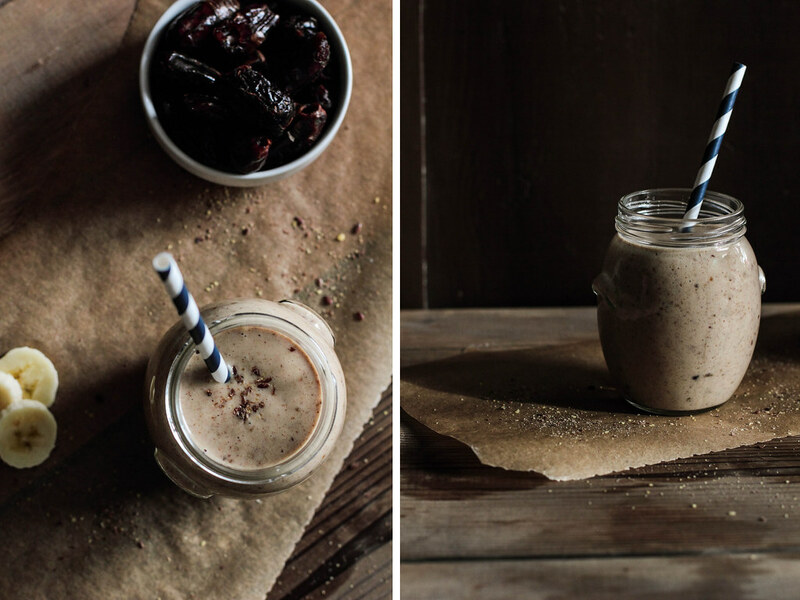 This Almond Date Banana Smoothie is naturally sweet and has a character all its own. 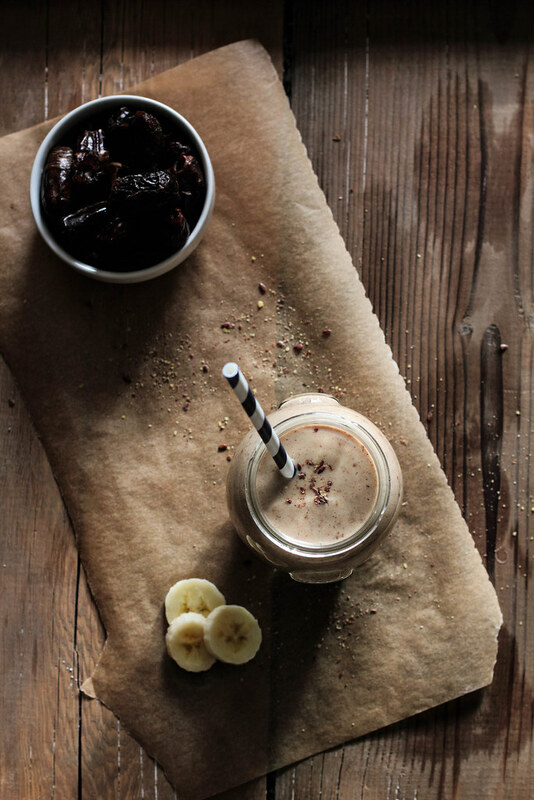 A frozen banana composes the base, a spoonful of almond butter adds a nutty tone, and a handful of dates gives it a rounded flavor. Small pieces of date are left in the drink, giving a nice little treat for each bite. 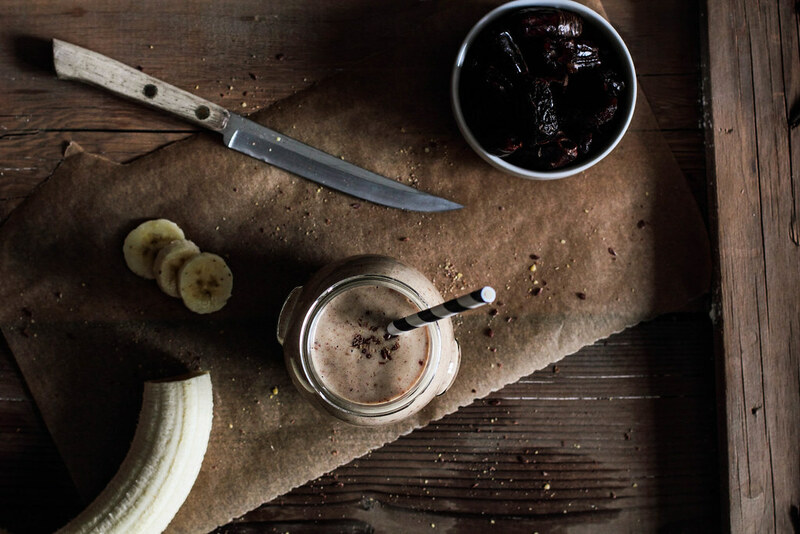 Though this smoothie may be simple, the flavors are sophisticated and perfect for an early morning or afternoon on the go.